Recipes by the Haggis and the Herring: Vindaloo is Portugal's Butter Chicken? Vindaloo is Portugal's Butter Chicken? Hearth and Soul Hop-volume 37! Yum! 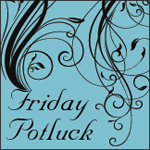 Thanks for linking up with Friday Potluck... heading over to check out the recipe now! Love the dish and especially the flavor combinations....Wow! Thanks for sharing at the hearth and soul hop. Humph! I've never made that connection before, but it makes perfect sense. Thanks for the a-ha moment. And thanks for linking up with the Hearth and Soul hop. Best Valentine's Day Gift Ever. Ever.